Is anyone on the forum planning (or already made) a trip to Idyllwild, Beaumont, Banning, Hemet (California) or that area? I am looking for an update on travel in that area. The 1924 map below shows that back then the roads to Idyllwild had “controls.” That is to say that cars were only permitted to go in alternating one way convoys so that there was no opposing traffic on the 18% grades and switchbacks to and from the mountaintop. I note a dirt road between Idyllwild and Hemet on modern maps that is named “Old Control Road,” no doubt for obvious reasons. The map also shows the road through Beaumont and Banning. 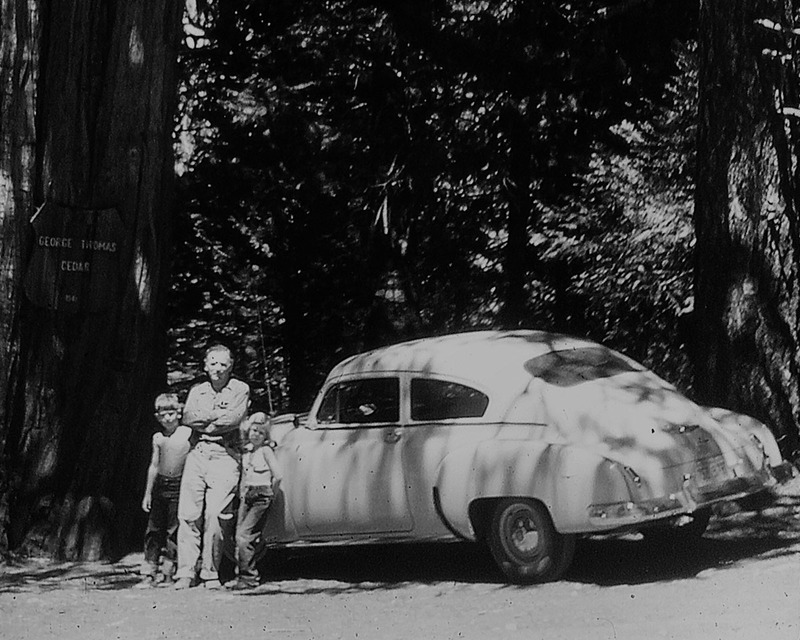 I have included a photo of yours truly, dad, and my sister beside our 1949 Chevrolet, standing along the old road in Idyllwild, under the “George Thomas Cedar” tree, which the Idyllwild newspaper says blew down in 1947! I guess that makes it a ghost tree in the photo! After WWII and up to about 1950 we frequently vacationed at Idyllwild, borrowing the summer cabin of a friend by the name of Charles Smith. In those days Idyllwild was a mountain village, with a lodge and a small grocery store, and a service station where we bought the white gas for our lantern. The cabin we borrowed didn't have electricity, so the Coleman two mantel lantern was a must. On the way to Idyllwild in those days the most evident landmarks were the Orange orchards that lined both sides of the road as we drove out from La Canada through Riverside. We usually took the road through Hemet (now Pines to Palms Highway) to reach Idyllwild, and the road via Banning (Route 66) on the way home (see map). The road down to Banning was as crooked as a snake, and the mountains subject to dense fogs. One year going home dad had to open the car door on our 1941 Chev (the one we had before the '49) to see the white line, and I am telling the truth, at least as far as my memory serves! And that isn't the kind of story your mind would normally concoct! And if it is from my imagination,it still would make a great line..."The fog was so thick I had to open the car door to see the road!! " Anyway, enjoy the old map (Click the map for a larger view) and share any experiences you have had on these roads! Can't help you with an update, but LOVE those 2 pictures! Thank you for sharing them. First, thanks for the come back! It was common practice, at least in Southern California, to control auto traffic to one way on treacherous mountain roads, sort of like we control traffic at road construction sites today. Of course the controllers didn't have two way radios, so the last car in the convoy was given a token, in my experience often a red flag on a stick. The token was then handed to the controller at the other end to signify that the last car in a convoy had come through. It was a big deal for me as a youngster when we got the flag. A side comment some may find a little interesting, especially those who are mountain bikers. The old Moreno Grade (see map south of Beaumont) is now called the Jack Rabbit Trail, and is frequented by mountain bikers. Most don't know it was once an important connecting route between Beaumont and points south. Of course, the experiences of early auto travelers are a part of my interest in the old roads, and maps like these each tell a story. Love the '49 "Aeroback" Chevy--but those two kids look like trouble! No personal experiences on these two roads, although they look like fun drives, but if one wants to see what the "P to P Highway" (SR 74) looked like nearly 50 years ago, check out the classic comedy "It's a Mad, Mad, Mad, Mad World". The opening sequence--in which Jimmy Durante 'kicks the bucket'--was shot on one of the winding stretches of said highway. The film was released for the summer of '63, so the sequence was probably shot in summer/fall '62. I think the closest I've been to a 'control road' is the Pikes Peak Highway, where one must stop at a 'control' point on the way down so that the attendant can check to make sure you aren't overheating your brakes! Locally (Tucson AZ), the unpaved road up the back (north) side of the Santa Catalina Mountains from Oracle to Summerhaven is still called the Mount Lemmon Control Road, and as it was the original route up to the top of Mt. Lemmon, predating the paved Mt. Lemmon Highway that winds up the south slope of the range by quite a few decades, I'm guessing it was also once 'controlled' in the same manner. I recall escaping from the summer heat in Tucson by driving up the modern road when I was a student at UA. About all I remember was a restaurant and some cabins at the top. I bet it has changed! Thanks a lot for the come back! Summerhaven/Mt. Lemmon has changed a lot in just the past few years, as a devastating forest fire in the summer of '06 wiped out most of the original community. So nearly every building up there now is new--and much more fire resistant! I can't help with updates at least until August when I may be in the area as part of a Route 66 festival trip. If so and time permits, I could see trying to work in a Banning-Idyllwild drive. A road that DeLorme labels "Banning Idyllwild Panoramic Highway" gets my attention. Although I have no experience with controlled roads, I definitely remember construction zones that used flags or batons to control one lane traffic. I've driven through them and worked on them as a flagman in the 1960s and, like you, I remember being thrilled in even younger days when Dad got the flag. I was sure they only gave it to important people they knew they could trust. Always fun to enjoy one of your come backs! Thanks! Just don't take the panoramic highway in the fog! The “control road” still exists, and it would be interesting to know if it is drivable. It wasn't unusual for the wind or rain to blow them out! They looked like cannon balls and were called “spherical torches” or “smudge pots” and were used from the late 1920's until the battery powered strobe lights replaced them. “Adequate warning” in those days was a sawhorse with a smudge pot on top. I drive down a two lane road today at night with a reflective center line, fog lines, and construction zones that are as well lit as daylight, and wonder how we survived back when. Are your "control road" and DeLorme's "panoramic highway" the same thing? I certainly remember "smudge pots" but also remember flashing electrics showing up about the time I was a high school senior so I don't have tons of experience driving toward them. I guess the surface reflectors you mention made a bigger impression on me. I think the technology made a big leap (or the costs made a big dive) in the early 1970s because that's when I remember them showing up as edge markers far from the city. I distinctly remember being in awe of the path that magically appeared before me as I drove a completely unlighted stretch of winding road on a dark night around 1975. I also have a memory of the earlier big advance of simply painting a white stripe along the road edge. When Ohio first did that to all state routes, some signs were posted touting the improvement and identifying the governor. I don't even remember who the governor was but I don't think my Dad liked him much. I recall him passing the signs and muttering "You'd think he got out there and painted them all himself." Though obviously not the same, this reminds me of how big of a deal it was for us kids (my sister and I, that is) to have a semi honk back at us when we did the yanking motion on road trips. What a blast that was. I think the Panoramic Highway is the one between Banning and Idyllwild, and is the road I recall Dad driving in the fog with the door open to see the road. The controlled roads were the two that entered from the south. Of those two, the more westerly road is the dirt road today, and the more easterly is now the main road.